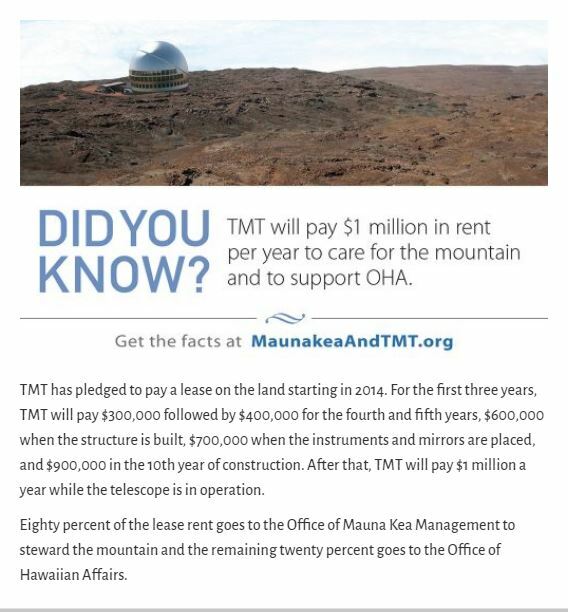 Paying $300,000 annual lease rent, which will increase incrementally to $1 million when it’s operational; 80% goes towards the stewardship of Maunakea and 20% to the Office of Hawaiian Affairs. The astronomy sector in Hawaii generates economic activity through its purchases from local businesses, its payment to its employees, and spending by students and visitors. According to an economic impact study released in 2014 by UHERO, the economic research organization at the University of Hawaii, the astronomy had a total impact of $167.86 million statewide in calendar year 2012. The largest impact was found to be in Hawaii County at $91.48 million. In addition to contributing to output, astronomy activities generated $52.26 million in earnings, $8.15 million in state taxes, and 1,394 jobs statewide.